November 4-19, 2017 in Park Ridge. Tickets are now on sale for Petite Opera's November 4-19, 2017 production of Barber of Seville. Don't miss this comic must-see production, translated into English so comedy prevails! This new production, featuring the ever-loving Figaro, exchanges the traditional recitatives with comic dialogue, and adds a new twist: the composer, Gioacchino Rossini, is a new character in the show. He inserts himself into the production and acts as a type of MC to add color commentary, introducing the scenes and characters to the audience. Not to be missed! 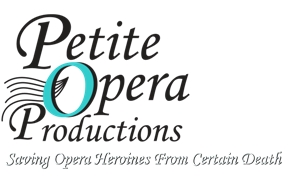 Buy your tickets online via credit card at www.petiteopera.tix.com, or place a reservation for cash or check payment: Phone 847.553.4442 or Email tickets@petiteopera.org. We'll see you at the show! For credit card orders, visit our http://petiteopera.tix.com. Please note: reservations and Credit Card orders accepted up to 4 hours prior to show time. A convenience fee is applied to all credit card orders at checkout.